MR. TIFFIN'S CLASS HAD NEVER HAD AN AUTHOR VISIT THEM BEFORE. "EMMA CRANE IS A POET!" SAID MR. TIFFIN. "AND DOESN'T KNOW IT!" SAID ROBERT. "THAT RHYMES!" "NOT ALL POEMS RHYME," SAID ELINOR. Mr. Tiffin's kids are used to having unusual things happen in their class. They've computed the average number of seeds in a pumpkin, and they've solved apple riddles in an orchard, but this visiting poet thing is a new wrinkle, even for Mr. Tiffin. And when Mr. Tiffin tells the class they are going to write their own poems to share with Emma Crane, most of class takes it in stride. But superstar student Elinor worries herself right into full-blown writer's block. Writing poems has to be harder than just writing sentences with proper punctuation. Poetry is serious writing, and Elinor is afraid her poem will not be perfect, at least not perfect enough to read to a real poet. We're out of apples, kids--again. Don't eat so many, please! They're costing me a lot of dough. You think they grow on trees?? But Elinor just can't get her poem to be what she wants it to be. She even tries composing six haikus with at least three metaphors and two similes! "THIS STINKS!" she said. "THESE ARE NOT POETRY!" The classroom bulletin board is covered with famous poems and student poems, but when A Poem In Your Pocket Day arrives, Elinor sadly realizes that she will be the only student who has no poem for her pocket. What will a real poet like Emma Crane say to her? "NO POEM IS PERFECT." SHE SAYS. "... THE WORDS DISAPPEAR LIKE CHALK ON A SIDEWALK IN THE RAIN." 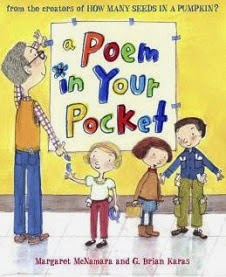 Emma Crane smiles and tells Elinor that the poem in pocket of her mind is quite good enough, in Margaret McNamara's latest, A Poem in Your Pocket (Mr. Tiffin's Classroom Series) Schwartz and Wade, 2015). with all the varied characters in her Mr. Tiffen's Classroom series getting ready to celebrate Poetry Month in April. As in the previous titles in the set, noted artist G. Brian Karas provides his uniquely charming illustrations of different children, each finding his or her own poet's eye in their own way in Mr. Tiffen's busy classroom. Namara's and Karas' previous noted books in this series are How Many Seeds in a Pumpkin? (Mr. Tiffin's Classroom Series) and The Apple Orchard Riddle (Mr. Tiffin's Classroom Series) (See reviews here).